Peace to All Beings: Local food, farm tours--what would Gandhi and St. Francis have to say? Local food, farm tours--what would Gandhi and St. Francis have to say? I was thrilled to be asked, along with a local minister, to answer this question for the Faith Page of the Lawrence Journal World--"What can this weekend’s Farm Tour teach us about God’s creation?" My article is below. If you click here, you'll see my article and the minister's article, followed by comments. Every time we get a chance to speak out for the helpless and the dominated, especially when it is to a wide audience, there are sparks of recognition, moments of heart connection. Let us never give up spreading words of compassion. 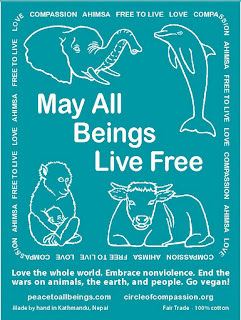 Like seeds they grow and flower and make more seeds--enough to bring peace to all the world and to all beings. Here is the article itself. The Kaw Valley Farm Tour takes place this weekend, October 2 and 3. What a beautiful way to celebrate and feel true gratitude for the fall harvest. In a lovely coincidence it happens that October 2 is Gandhi’s birthday, and St. Francis Day is October 4. Both Gandhi and St. Francis radiated joy and love, because they were so in tune with God’s creation. 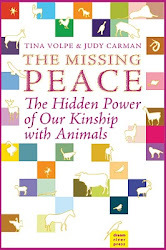 They experienced a sense of kinship with all life and endeavored to teach tenderness, reverence, compassion, and complete nonviolence toward all creatures. On the Farm Tour we will see God’s bountiful gifts of food. One seed can grow a plant that offers us, not only baskets of nourishing food in myriad forms and vivid colors, but also seeds to grow more food year after year. How beautiful and miraculous—just to be a witness to the bounty of food we will see on the tour is enough to experience the Divine mystery of God’s love for us all. At some of the farms on the tour, we will also see animals. When we look into their eyes with open hearts, we can see the wonder of God’s creation. We can witness the extraordinary grace, beauty, individuality and sensitivity of each animal and recognize what kindred spirits they are to us. Every child knows how thrilling it is to be near them and maybe even to touch them. As we tour the farms and celebrate the gifts of God’s gardens and the wonder of God’s creatures, let us consider the wisdom Gandhi and St. Francis discovered. Gandhi devoted his life to nonviolence toward all living beings, and St. Francis was known as the patron saint of the animals. He strove to imitate his beloved Jesus in all that he did. They taught us that the animals are our spiritual brothers and sisters—part of the Divine family created by God and that they were not created for us to dominate, exploit for monetary gain, or kill. Animals are here for their own reasons--to raise their families, to run and play, to be free to do what they were born to do, to love and to live. Teachers of many faiths have taught that we human beings cannot achieve peace and nonviolence for our species until we extend it to all God’s creation. Living nonviolently draws us closer to the heart of God.